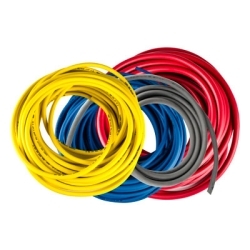 1/4" ID x 1/2" OD POLYAIR® Gray Air & Water Hose | U.S. Plastic Corp. This 1/4" ID x 1/2" OD Gray PVC Air and Water Hose have a working pressure of 300 PSI at 70°F and 180 PSI at 122°F. Standard length is 100'.